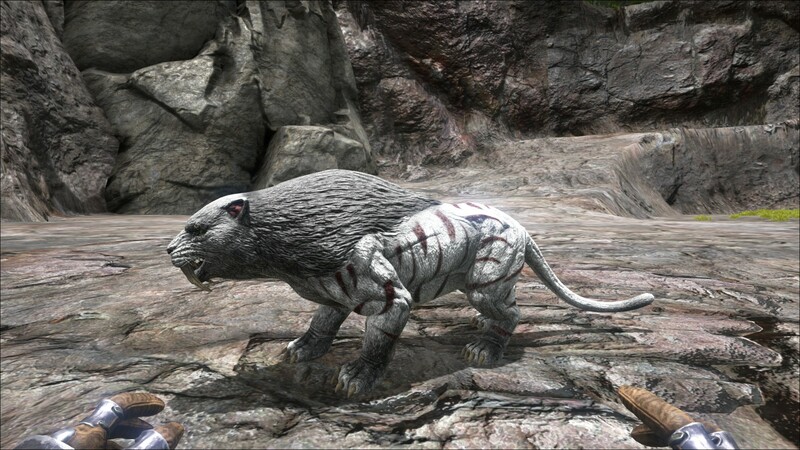 The Smilodon, or simply Sabertooth, is one of the Creatures in ARK: Survival Evolved. Smilodon brutalis is a solitary hunter, generally found in cold, lightly wooded areas. The Island's mountains are the perfect habitat, as the mammal's fur keeps it safe from the bitter temperature. While its huge fangs are excellent for delivering deathblows, the creature's claws can be just as deadly. Despite normally being a solitary creature, Smilodon brutalis are not opposed to hunting in small packs. In fact, they have to do this to take down larger prey such as Mammoths. Enough Sabertooths can take down a Carnotaurus, perhaps even a Tyrannosaurus. Either way, Smilodon brutalis should not be underestimated. While not as fast as Raptors, there's no denying the Sabertooth's increased resilience and power. In addition, well-trained Sabertooth can be taught to use their claws to flay corpses. This may sound morbid, but it is among the best ways to quickly gather large quantities of hide from the giant beasts of the Island. These large cats are mostly common around mountains and survive well in cold surroundings. As they are highly aggressive they will immediately try to pounce at you once you come in their sights. As they inhabit most of the "higher level" area' it is best to avoid them until you are able to fend for yourself. They mostly walk in pairs but can in rare cases be found in groups of up to six. Those that spawn closer to the shorelines (mostly near beaches around the mountains) will tend to spawn alone, though sometimes come in pairs. This comes in handy if you are thinking about taming one, but you should still proceed with caution. As they spawn near the most dangerous environments once one does appear it will start attacking almost anything nearby, usually resulting in their demise. Packs can often be found and are a decimating force on both other mountain wildlife and unequipped players. The Saber appears as a large cat with well-developed forelimbs and exceptionally long canines. The differences between it and its cousins in the fossil records are that it sports a longer, panther-like tail, its snout is seemingly shorter, and its head is more hunched to the ground. The ears are pointy like that of house cats. The fur on its head, upper torso, shoulders, and back is thicker and longer than the rest of its fur, which is textured with tiger-like stripes. The eyes are lime green with cat-like pupils. The nose is pink and panther-like. The snout also has noticeable whiskers. Also only males have a mane, females do not. This section displays the Sabertooth's natural colors and regions. 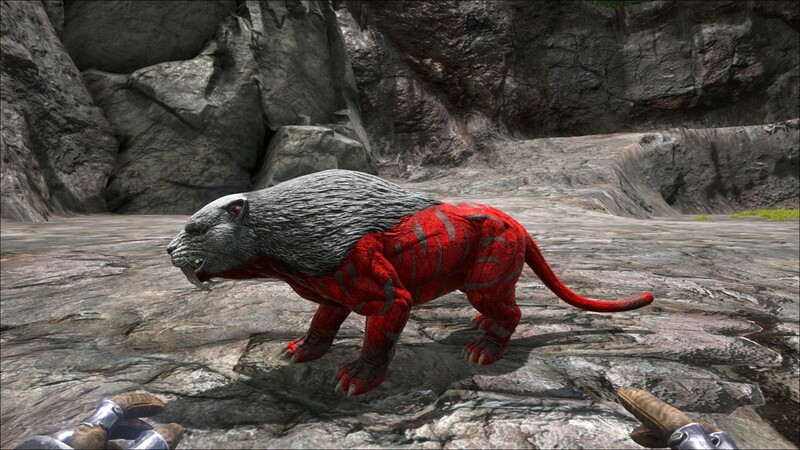 For demonstration, the regions below are colored red over an albino Sabertooth. The colored squares shown underneath each region's description are the colors that the Sabertooth will randomly spawn with to provide an overall range of its natural color scheme. Hover your cursor over a color to display its name and ID. For example, "cheat SetTargetDinoColor 0 6" would color the Sabertooth's "body" magenta. After you knock out a Sabertooth, be aware that there are usually at least 3 or 5 that travel in packs. However, if you are lucky you can pick one off on its own. They can be picked up by a Quetzal or Argentavis, making it easy to separate one from a pack and put it in a small box with windows to shoot arrows through. However, if you find one by itself you can also just bola it and tame it right there. When taming a Sabertooth in the mountains, make it (probably them) aggro you, then run past them uphill. Depending on the steepness of the slope, they may get caught trying to follow you. When you notice that they've stopped running, you can then easily shoot them with tranq arrows. This section describes how to fight against the Sabertooth. Sabertooths are fast creatures that are capable of getting the jump on you if you don't see them coming. If you encounter a pack, try to get them stuck or get up to a higher spot and pick them off one by one. Get to higher ground and shoot at the Saber, or use a bola and hit the back of it with a melee weapon. Bolas are very effective with only a few sabertooths. Long range weapons are very effective. If fighting only one or a few, use melee weapons on the back of a restrained saber tooth, so they don’t attack, but the max damage is applied for easy killing. Sabertooths usually travel in packs. If you encounter one you are likely to encounter its 2-5 friends as well. Keep this in mind. If you encounter them on a mountainside be careful not to end up downhill of them. They have a significant knockback and can easily send you flying down the mountain to your demise. Their high speed makes them difficult to flee from. Head shots do 3x damage so aim for the head. They are also susceptible to bolas and bear traps, so use those to your advantage. Very useful to hunt for keratin, chitin and hides with the Sabertooth. While some believe that the saber is faster than the raptor (despite what the dossier says), they are indeed slower when not carrying a load. Not only does a mounted saber only walk by default unless sprinting, but an unburdened raptor will outrun them with ease. It is important to note that the base weight capacity of the Sabertooth is 200 vs the 150 for a Raptor. This causes a Sabertooth to move faster than a Raptor under certain loads, because of their ability to carry more weight (and ultimately a rider) before becoming slowed due to encumbrance. It can also sprint jump to catch up with raptors very easily, but this will quickly deplete stamina. So which one is fastest in the field will depend on the conditions. Smilodon means "knife tooth", brutalis means "cruel"
The Smilodon in the game have long tails similar to modern big cats such as tigers and leopards. In real life, Smilodon and other saber-toothed cats have very short tails like those of bobcats or lynxes. 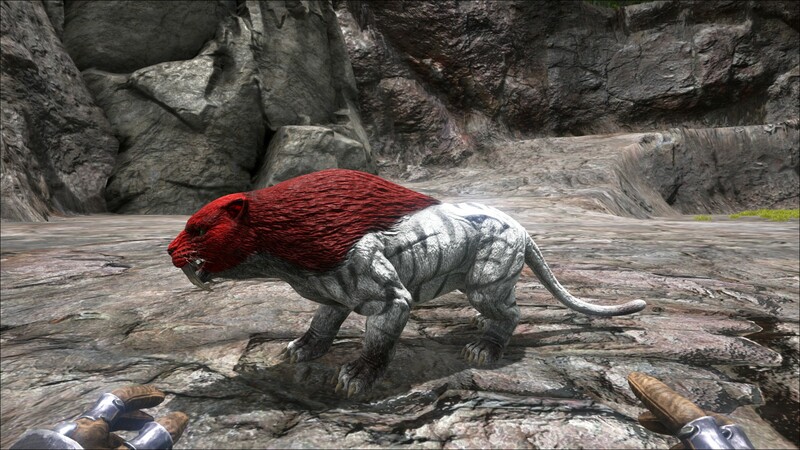 The Sabertooth is the first creature to ever receive a complete overhaul in its appearance. This page was last edited on 22 April 2019, at 12:39.